After reading this and other articles on the uses of Zotero, I downloaded it and I'm now trying it out. It can serve as the storage location for all my notes, with links to all my PDF scans (because photocopies and file boxes are yesterday’s trauma). It allows me to organize this information in multiple ways simultaneously — by ancestor, by status of completion, by library, by whatever, without duplicating anything. It guides me in creating a bibliographic source, and I only do it once. It allows me to search across a large database in an instant. It provides access to everything, anywhere I have the Internet. Zotero seems to do quite a lot of things. It does one thing that Evernote used to do, but no longer does -- it syncs data on two computers (or more) though a remote server at zotero.org. You can download a free copy from Zotero.org and try it out yourself. Its main use, however, seems to be managing bibliographies, which is a more specialised task than note-taking programs like Evernote or OneNote. I actually found askSam more useful, even though it doesn't sync, because it allows both structured and unstructured data in the same file. To sync I just use a flash drive and a batch file to copy data from one computer to the other. For more on those programs see Genealogy notes and news: Using Evernote, OneNote and askSam for genealogy. I've barely scratched the surface of Zotero, but if you are doing any kind of research that requires a bibliography and bibliographical citations, have a look at it. It's free, so you lose nothing if it doesn't work for you. One of the things that impressed me about Zotero is the ease with which you can populate your bibliography. For one thing, you can type in the ISBN of a book, and it will find the rest of the information. It will also grab bibliographical information from sites like Amazon.com, though it doesn't seem to work too well with GoodReads -- it gets some of the information, but not all, and records it as a web page rather than as a book. Evernote may still sync for all I know, but it doesn't seem to work anymore for my desktop computer, which runs Windows XP, which, as all sorts of messages keep telling me, "is no longer supported". Now I know computer businesses need to make mopney and need to pay their staff and planned obsolescence is a tried and tested way of getting repeat business. But I'm a pensioner, and I can't afford to buy a new computer every couple of years, and a new operating system to go with it. So I just have to make do with what I have and hope that it lasts for the rest of my life. That's one reason that I don't use Ancestry.com -- not only can't I afford the subscription, but my browser is no longer supported, and if I want to update it I'm told my operating system is no longer supported. Using a genealogical search as part of a plotline has always been a fascinating topic to me. Recently I met Juliette Godot on Twitter and asked if she'd mind letting me pick her thoughts a bit on the subject. And my own novel The Year of the Dragon | Khanya has some genealogical research woven into the plot. It is free, with the stability and support of a university backing it up. Even if you are syncing to the Zotero cloud, you can do that for years on free storage, before you have to buy some. And when you do buy storage, it’s inexpensive and unlimited. It can organize and provide one-click access to the thousands of documents, spreadsheets, photographs, and other files you have saved to your hard drive. In essence, it can draw all those files together into a uniform, organized system. Zotero becomes your door to all you have collected. Our vision for the organization is to extend our platform of support. Much like a genealogical society, we will offer a premium, “contributing” membership category, which will come with a slate of benefits such as training webinars, product discounts, and other opportunities offered by our partner vendors. A free, basic membership category will still be offered, and all current members will be “grandfathered in” at this level. Be sure to #watchthisspace (this blog) and Sign-up for our email list if you haven’t already. More details will be coming later this month. This morning I had a dramatic demonstration of the effect of the Internet on genealogical research when I accomplished in three hours what would have taken three years or more 30 years ago. Someone asked me about an Arthur Knight James, who married my wife's second cousin twice removed, Lilla Ethel Green, in Cape Town in the 1920s. He deserted her and they were divorced after two years, no kids, so I wasn't planning to follow him up. But then I thought why not see what I can find. My correspondent had sent me his date of birth (1896), and those of his siblings somewhere in the UK, said they came to South Africa early last century. I went to FamilySearch, and there he was in the 1901 Census, with a sister and both parents. It gives father's year and place of birth, so I find father living with his parents in an earlier census. Find there are three duplicates of the family on FamilySearch, so make a few more checks and merge them. Then come back to the mother. She died in 1906 in Pretoria. FamilySearch has her death notice. It gives the address of her parents, J & E Knight. Her husband has filled in the death notice, under children has written "Nil". He lies. There were at least two, as shown by the 1901 census. I find her parents at the address given in the death notice -- in the 1911 census. The mother has died, but father is there, with another daughter and a granddaughter, Alice James, a third child to add to the "Nil" on the death notice. Why did her dad lie about her existence? All that, as I said, took about three hours. Thirty years ago, to accomplish the same thing, I would have had to travel 65km to Joburg, to the LDS library, where I would have had to pay R25 to order the relevant microfilm from Salt Lake City (assuming I knew which one to order). Then wait three months for it to arrive, and travel back to Joburg to consult it, and scrolling through it to find the record I was looking for might well have taken more than three hours. And having done that, repeat the whole process for the next film -- pay R25, wait three months, drive 130 km to consult it, and so on the the next film, and the next and the next. And thirty years ago, when we had to do all that, we thought we had it good. Go back another 30 years before that, and consulting the 1901 census would have required a 6000 mile flight to London and a visit to the Public Record Office in Portugal Street or somewhere. Oh wait! Back in 1958 the 1901 Census was not available for consultation. Come to think of it, it wasn't in 1988 either. No, our search back then would have begun and ended in a dank and dingy dungeon under the Palace of Justice in Church Square, where we would have had to go to consult the death notice of Annie Knight James in those days, rather than the air-conditioned reading room of the National Archives of today. So when you complain that FamilySearch is offline, or the Naairs computer is responding slowly today, just be thankful for resources like FamilySearch, Naairs and FreeBMD, which enabled me to do three years' work in three hours this morning. To start making use of this technique choose a genealogy site that you would like to search the contents of and enter “site:” and the URL (minus the https:// part) into google. Then add your search terms. Here is what it will look like. site:www.url.com your search terms. Check the whole article for fuller information. In the last couple of years FamilySearch has completely changed the way I do my genealogy research. I now spend most of my research time comparing records in FamilySearch with what I already have, and reconstituting families from FamilySearch data. FamilySearch has had its ups and down over the years, and sometimes useful features have been withdrawn and not replaced for some time. There are remnants of that in a poll in the sidebar of this blog. One useful feature recently withdrawn was the "Search Results", which I hope returns before long. But what makes FamilySearch more useful now is its integration with programs like RootsMagic and Legacy Family Tree. The main hindrance to this usefulness is the "My Tree" attitude of many genealogists. There are many web sites that allow you to put your family tree on line where it can be seen by others. Some are static, and are difficult to update. Others are dynamic. But most of them are not collaborative. And people who have become used to that model are suspicious of collaborative projects like FamilySearch, because they don't like the idea of anybody else changing anything in "My Tree". In the days when Ancestry.com had a free version called Mundia, I used to refer to it quite a lot. It followed the "My Tree" model, and so you could find multiple versions of the same family on line. It also encouraged people to uncritically copy information to their own tree from others' trees. This uncritical copying often resulted in errors being multiplied. The majority was not always right. An inaccurate tree could be copied 10 times, and the accurate version could be copied only once or twice. You could follow the majority version, but it would be wrong. For some examples, see Jane Ellwood and the perils of online family trees, and Three Agnes Ellwoods -- Tombstone Tuesday. FamilySearch still lets you have your tree, which no one else can alter. But the place for your tree is on your computer. You alone decide if you want to copy information from FamilySearch to your computer, so nobody else can alter your tree. But you can also share your research with others by copying information from your tree to FamilySearch. So this is what I do now. I look at my "Research" file on my computer, which is a copy of my "Main" file (where I keep mainly verified information). The Research file is more speculative, where I add possible links to be followed and verified later and so on. I find a family that I have not looked at for some time, and check it with FamilySearch, comparing the two records side by side. Sometimes I find someone has added information that I did not have -- parents of s spouse, for example. If they look likely I copy them to my Research file (not to my Main file at this stage). I then click on the link to FamilySearch in my genealogy program and log in to FamilySearch on my web browser. That brings up the same family. 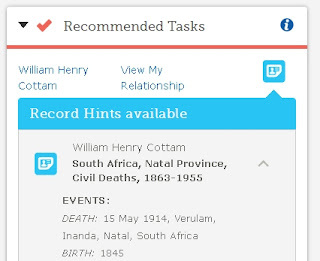 For each member of the family there FamilySearch may bring up "Research Hints". These are the best research hints in the business. The suggestions are not always accurate, but in my experience they are right about 80% of the time. For example, it may suggest a link to the person in one or more censuses. You are then offered the opportunity to attach the census record to that person as a source. That will also create a "Residence" event for that person in FamilySearch, which you can also copy to your own tree on your computer if you wish. The census records are often transcriptions, so need to be taken with a pinch of salt. There may be mistranscriptions and spelling errors, but you can make a note of these. You may find that someone has already attached this source to another person. There are then three possibilities. One is that they have attached to to the wrong person. Another is that they have attached it to the right person but it is not the person you are looking for. A third, and the most common, is that the person they have attached it to is a duplicate of the person you want to attach it to. If that is the case, FamilySearch offers you the possibility of merging the duplicate people. If you are sure that they are the same person, merge them. If you have doubts, you can contact the person who attached the record to discuss it with them. FamilySearch has a research trail, showing every change made by anyone, so that you can contact other users (sometimes a long-lost cousin). When you register to use FamilySearch, your record contains your contact information, which can include your e-mail address. I recommend that you include that, so that people can contact you about shared family members. There is also, both on the FamilySearch web site and in the programs that link to it, a place where you can have discussions about problems relating to a particular person in your tree. Thus you can query information that someone else has added, that you think may not be accurate, or you can query discrepancies in records. There are things to be careful of. For example, FamilySearch has lots of church baptism records from the Church of England. These have been transcribed from microfilms of the original registers, and sometimes two or more microfilms were made of the same register. The microfilms and the transcriptions made from them, vary in quality. One particular error is that the transcriber often included as a "Residence" the location of the parish where a baptism took place, rather than one taken from the "Abode" field in the register. Where this is apparent I usually don't copy the "residence" information, and am careful about assuming that the place of baptism was the place of birth. Sometimes a census will show that the date of birth was different. This is the kind of thing you can add to the "Discussion" field. In working like this with FamilySearch I'm usually adding several new people to my family tree each day, even if they are only seventh cousins. I am also organising scattered individuals on FamilySearch into families, which helps make it more useful for other members. And there's more than enough there to keep me busy for the rest of my life. One of the questions that sometimes bothers genealogists is what happens to their research when they die, especially if no one in their immediate family is interested. But if you share your research on FamilySearch, it is there for others to make use of and add to, long after you are dead. So drop the "My Tree" approach, and rather join the larger human family. FamilySearch offers the largest database of free genealogy records on the web, as well as numerous other collections that are available to view digitally at a Family History Center. In fact, many of Ancestry’s indexes are pulled from the original records of FamilySearch. FamilySearch can be searched at no cost and the records viewed by anyone. They also offer an enormous, collaborative family tree and those who use it can take advantage of hints from FamilySearch’s databases. I've never had much use for Ancestry.com. For a start, as a pensioner I just can't afford it, though we did at one time make use of their free Ancestry Lite version called Mundia until it was withdrawn. It gave access to Ancestry public trees, which could be useful, though it was, as this article warns, important to be on your guard, because there are a lot of very inaccurate family trees on Ancestry. For example, Three Agnes Ellwoods: Tombstone Tuesday | Hayes & Greene family history: we discovered a lot of online family trees for Agnes Ellwood Tallon, on the soon-to-be-closed Mundia site (no links, as they won’t work after September). And every one that we looked at linked to the wrong Agnes! The Family History Daily site also publishes somewhat misleading information by confusing genealogy programs (which run on your computer and help you to record your genealogy) and genealogy web sites (to which you can upload a copy of your family tree). They do acknowledge that they get paid to write about some of the sites that they write about, but by blurring the distinction between progams and web sites they are confusing a lot of people. 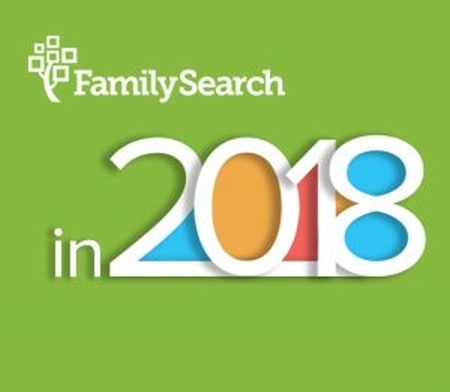 So regardless of what they say, I will maintain that the best online family tree site is FamilySearch. I have grave reservations about Geni.com and MyHeritage -- the latter has some distinctly dubious business practices. In general, I've found FamilySearch's hints to be both useful and usable. Of course the usual warnings apply -- check and verify them with other sources. And FamilySearch also has the advantage of having a single public tree. Some people seem to get quite upset at the notion of not having "my tree" on a remote public site, as they can do with sites like Ancestry.com, but that is a bit silly, because the place for "my tree" is on my computer, not on a remote site (other than for backup, of course). The advantage with FamilySearch is that at least two genealogy programs, RootsMagic and Legacy Family Tree, will interact with the family tree, and let you compare your information with that on the public tree, and copy it either way. If there are disputed pieces of information (different dates of birth, for example), you can start a discussion about it, which you can see on your computer, and others can see on theirs, or on the FamilySearch site itself. In addition, every change that anyone makes is tagged, showing who made it and when. You can put your contact information in the tag (e-mail address etc) so that anyone who has conflicting information or wants to ask more can contact you directly. This is usually much more difficult on the commercial sites -- you have to go through the site to contact others, and you sometimes have to be a paid-up member to do so. Also, if you find that a hint on FamilySearch isn't useful, or is misleading, you can leave a comment on it, and say why you think it isn't a match, and in that way help other researchers. Sometimes the people at FamilySearch make "improvements" that don't really improve things, and make the site more difficult to use, but eventually they seem to discover those, and generally it's getting better all the time. Years ago, I chose to backup my GEDCOMs and related data with a fairly popular online service dedicated to that purpose. I let the service automatically save and upload my files as they were updated. It was very convenient and my account was 100% private, only for my use…or so I thought. One day I was doing some research online and came across my own tree. My private research online. I was shocked. I had not, at that time, publicly uploaded my tree to any online sharing site, yet there it was, with all of my personally collected records, notes and more. How had this happened? After doing some considerable digging I discovered that the backup service I was using was bought out by a large genealogy company and they had taken all of my files and published them online in their databases…and they were charging for the information. I was horrified. Not only had I put countless hours of research into private trees that were now available for anyone to access without my permission, but I knew much of the information I had in my trees was not 100% accurate. As I said, I had a similar experience -- see here MyHeritage.com — another scam site? | Hayes & Greene family history. various parts of Africa that have been affected by this. family history in any part of the African continent. interested, please invite them to do so as well. membership, though the people at Yahoo! try to make if very hard for members to do so, as if you follow the link they will often take you to a different web page instead, so you may find it easier just to subscribe to the list. The first national database to record all the natural and manmade treasures of burial grounds, from the giant Victorian urban cemeteries to little country churchyards, is to be created with a grant from the Heritage Lottery Fund. Guardian Today: the headlines, the analysis, the debate - sent direct to you Read more The grant will be announced on Monday to help record and preserve rare plants and animals in danger of extinction across most of Britain, threatened by development and modern agriculture, but still flourishing among the gravestones in an estimated 20,000 burial grounds in England and Wales. In an unassuming room, tucked away in Archives New Zealand's Wellington office, volunteers from around the world have been methodically working their way through more than 4 million pieces of paper. For the past nine years, it's been a base for FamilySearch, an international genealogy organisation, working to archive shreds of New Zealand probate records, up till 1993, and make them available online for free. It's an ambitious project that has, this week, finally come to an end with volunteers Mike and Lois Woods of Page, Arizona, in charge of digitising the last of the records. Recent changes to FamilySearch seem to have made it harder to use. These are two of the changes that make life more difficult for me, at least, in using FamilySearch for research, especially in census records. Previously, when searching for a particular person, it used to be possible to look at a record, and then go back to "Search Results" to look at another record in the set. Now, it seems that there is no way to do this, and one has to re-enter the search query each time. Previously it was possible to copy the record found in a search, and paste it to a document more or less as is. Now, if one does this, the document requires a lot of editing in order to be able to print it out and compare it with other records, because information that appears on one line on the screen now appears on several consecutive lines in the pasted document. Or am I missing something? Is there still a way to do those two things that I just haven't noticed yet? Has anyone noticed any other problems, or anything that has been improved? After further "improvements" it has got worse. Previously, after linking a record to the family tree, it was possible to go back to the same person in the family tree and continue from there. But now it takes you back to the "base person". And it stakes up to 10 clicks (+ waiting 30 seconds or more for the screen to reload each time) to get back to where you were to continue working. . While there is never a replacement for careful hand transcriptions, the simpler solution for transcribing your genealogy records is to use modern OCR. OCR stands for optical character recognition and there are a variety of options available online, as apps, in printers and scanners and as downloadable programs. The first step in this process is to have your records available in a digital format – such as a PDF or image (JPG etc). You can scan paper documents to make them digital before applying OCR – or you can apply OCR while you are scanning. See the bottom of this article for a bit more information on this. The rest of this how-to assumes that you are dealing with digital records. We tested a variety of OCR solutions – including FineReader and Google Docs – and found that, for our purposes, a free online option called Online OCR actually produced the most accurate results. It is also very quick and easy to use.